Tanker 4-1 (2014-present) – In 2014, the fire company purchased a custom Pie rce Velocity tank truck to replace the aging Volvo. 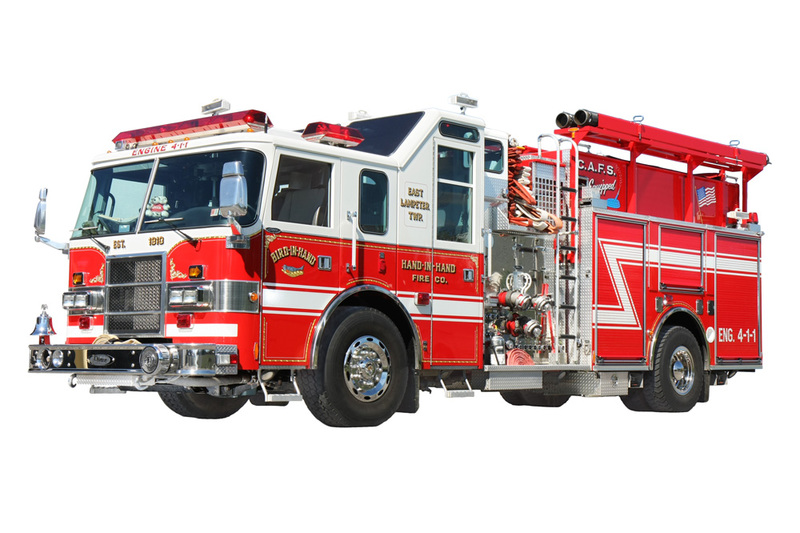 With a fire-bashing 4000 gallons of water, this tanker servers as the primary water supply for any fire in the Bird-in-Hand area and some neighboring fire companies. Key features include a top-mount pump control panel, 6 man cab for manpower, 550 horsepower Cummins engine for quick response, and signs above both crew doors saying “Giving Is Living”, a reference to kindhearted actions among the tanker committee members. Perhaps the most notable feature of this tanker is its setup for quick & efficient “nurse tanker operations” – 5 large hoses (3 on back, 2 on front bumper) for quick filling of the tank from other assisting tankers, and a Hale 2000-gpm pump that can actually pump about 2500 gallons per minute at very large fires. The “nurse tanker” setup is an extremely fast water delivery method. Squad 4-1 (2008-present) – Ordered on August 31, 2007 from the Kovatch Mobile Equipment Corporation, this new squad truck cost $194,323. 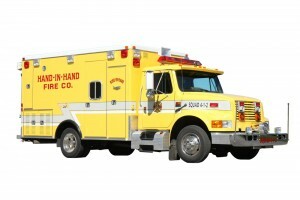 It is a medium duty walk around rescue with a 2007 GMC chassis 5500 KME. Its primary function is for fire protection and manpower for fire suppression. John Fazekas, Lonnie Kauffman, Lester Lapp, Allen Miller, and Rick Nields served on this committee along with Chairperson Reuben Stoltzfus. This vehicle was put into service May 2008. 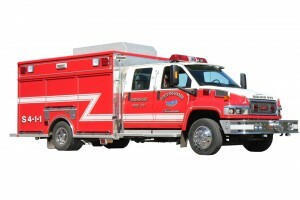 2000 Pierce Lance Pumper (2000-present) – This pumper replaced the 1980 Ford Pierce. It has a 900-gallon tank, a 2250 g.p.m. Hale pump, and carries eight firefighters. It is equipped with a compressed air foam system, 50 gallons of Class A foam, and 2,200 feet of 5” supply hose. The Pumper Committee was Tim Hoerner, Doug Glick, Reuben Stoltzfus, John L. Fisher, and Jim Fazekas with John Petersheim serving as chairperson. The pumper cost $460,000. 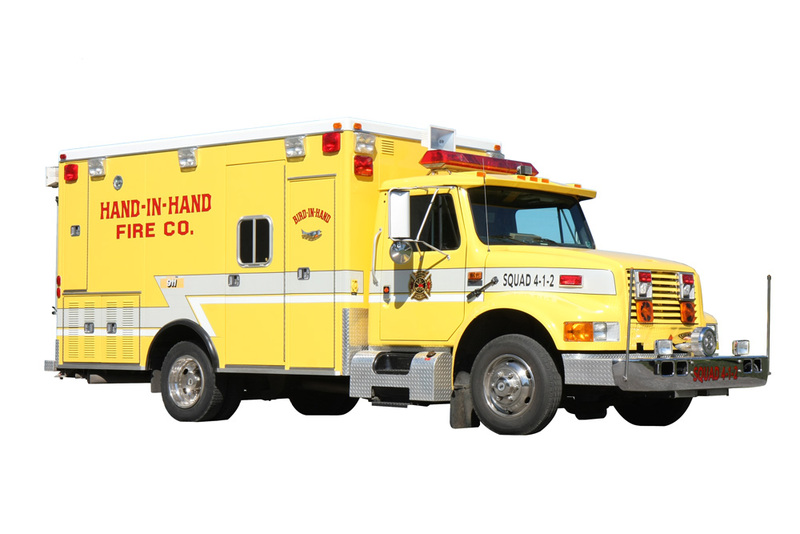 1990 International / Road Rescue Squad Truck (yellow) (1994-present) – When this yellow vehicle was purchased in 1994, it was decided to forego a new paint job and instead, use the funds to outfit it properly. The Ladies Auxiliary gave money to help to equip it for fire support, fire police support, and confined space. This vehicle has plenty of space to carry manpower and over the years the firefighters have become satisfied with the yellow color. Tanker 4-1 (1990-2015) – The chassis for this vehicle is a 1989 Autocar with a 365hp Volvo diesel engine. It has a 4300-gallon fiberglass tank and a 1750 g.p.m. Hale pump. 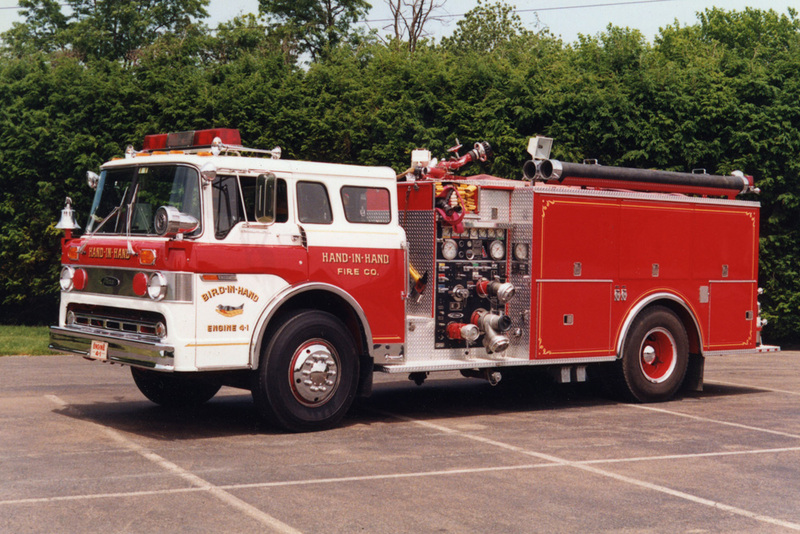 Made by Allegheny Fire Equipment Company, it cost $190,952 and was put into service on February 6, 1990. The Tanker Committee was comprised of Wilmer Lapp, Ken Barge, Jerry Smucker, and Ken Kauffman with Paul Smucker serving as chairperson. 1977 Dodge Power Wagon / Attack 4-1 / Brush Truck (1983-1994) – In 1983 this four-wheel drive vehicle replaced the Dodge squad truck. This vehicle was refurbished and altered for specific purposes by the Fire Company members in the old fire hall (2644 Old Philadelphia Pike), which was vacant at the time. It was equipped with a 250-gallon tank, a 250 g.p.m. Hale pump, and turn out equipment compartments. 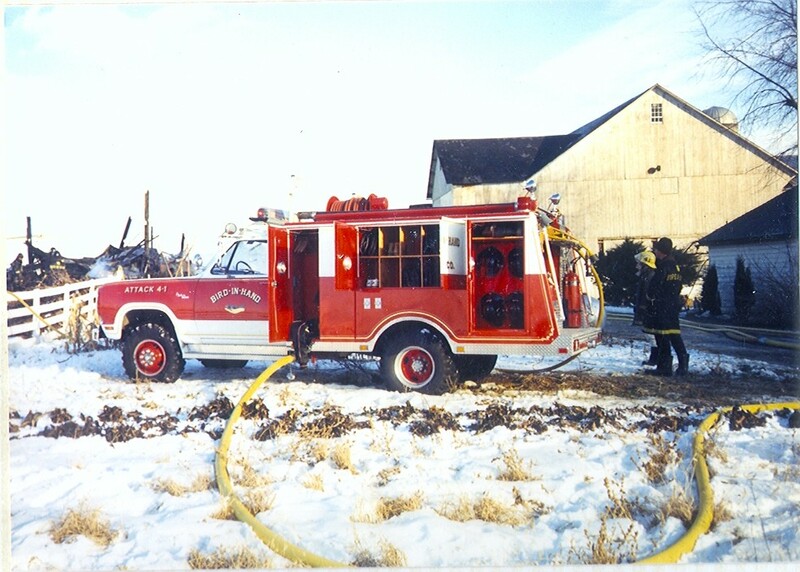 After this mini-pumper was replaced in 1994, it was used for additional manpower at fire calls. 1980 Ford Chassis (1980-2000) – This diesel-powered truck had a 750-gallon tank. The 1000 g.p.m. pump and the body of the truck were made by Pierce. There was seating for 3 in the jump seat and was equipped with self-contained breathing apparatus (SCBA). It also had large diameter hose (LDH) beginning with 4″ and finally, 1600 ft. of 5″ hose. This LDH served as a temporary water line that was laid into a fire scene by the engine, supplied by tankers at the street. This was the last fire engine equipped to carry firefighters on the tailboard, a common practice until the 1990’s. 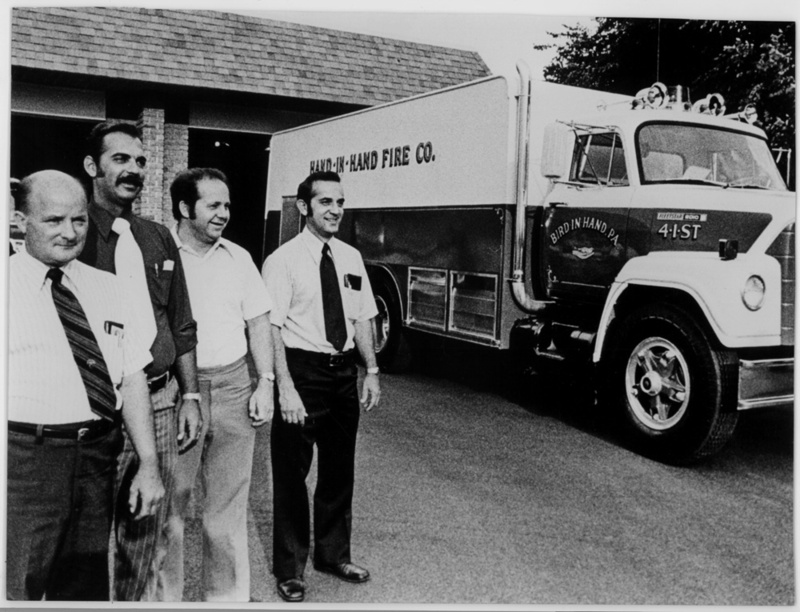 1968 International Tank Truck (1974-1990) – When Fire Chief Paul Smucker returned from a trip, he talked about the large tankers that the fire companies in the western states used. Knowing that more water was needed at local fires, he encouraged the Hand-in-Hand Fire Company to consider a large tanker. With the purchase of this truck, the water capacity was greatly increased. It held 4200 gallons of water and a 1000 g.p.m. pump. The Chrysler industrial engine was constructed on a 1968 10-wheeler International chassis. The tank was locally built. Aaron Horning of Farmersville welded the body together in his welding shop and the Fire Company members did the rest of the work, including the mounting of the pump, at Paul Smucker’s Farm at 431 Beechdale Road. 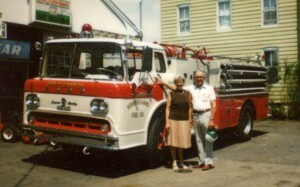 Jack Robinson painted the truck at his garage at 239 Maple Avenue. This was one of the first large tankers in the area and cost a total of $21,000. It was geared to go slow, but provided a lot of water at the fires. 1958 Dodge Squad Truck (1972-1983) – This panel van was purchased for $1,788.18. The Fire Company refurbished it and equipped it as a squad truck to carry gear and equipment. 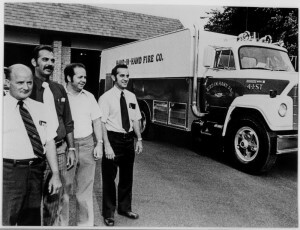 1960 Ford Chassis (1960-1980) – In order to handle the water supply more efficiently, the Fire Company placed the newly purchased Ford Chassis into service in November 1960. It had a Hahn body, a 750-gallon tank, and a 750 g.p.m. pump. Diamond T Chassis (1936-1960) – The Hand-in-Hand Fire Company authorized J. Harry Weaver, William H. Umble, and Everett E. Brubaker to purchase the Diamond T Chassis. It was delivered in December 1936 and was in service until November 1960. It had a 150-gallon water tank and a 350 g.p.m. Northern Rotary Gear pump, built by Hahn, which was set up to supply two 1.5 inch lines and a 100 foot ¾ inch booster reel. Ladders, hand lights, raincoats, caps, boots, air packs, foam, and two-way radios were added to this truck. This story about the Diamond T Chassis is in the 50th Anniversary booklet: This was the first engine in our area with an enclosed cab. It exposed our firemen to a lot of good-natured ribbing. They had the last laugh though, when their engine, cab and all, took the first prize of $25 at the Firemen’s Convention held in Quarryville in 1937. Today, all apparatus has fully enclosed cabs to protect their firefighters. 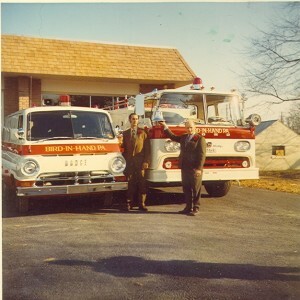 The pump on the Diamond T eventually broke down and plans were made to purchase a new pumper. A 300 g.p.m. 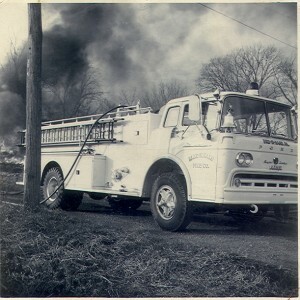 Hale portable pump that had been purchased in 1959 was temporarily mounted on the Diamond T. Neighboring companies responded with Bird-in-Hand on first out assistance until the new equipment arrived. Oldsmobile Chassis with Two Chemical Tanks (1922-1936) – This chassis with two chemical tanks, ladders, and other firefighting equipment was the first successful and useful motorized vehicle. Soon after this purchase the East Lampeter Township Supervisors gave the Fire Company $200 for the upkeep of its equipment. 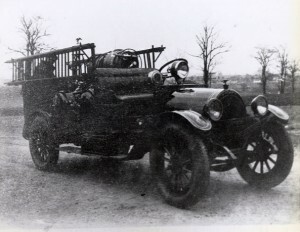 In the early 1930’s the Fire Company asked the Supervisors for funds to purchase modern equipment to replace the Oldsmobile. 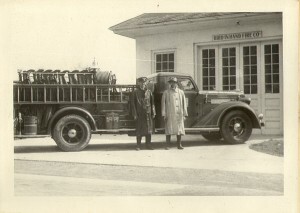 The matter of providing public funding for the Fire Company was put up for a vote after a petition with sufficient signers was presented to the Supervisors in 1934-35. It passed by a count of 560 to 272. Overland #90 Car Chassis with Soda and Acid Type Tank (1916-1922) – In 1916 the Fire Company decided to modernize and change from horse-drawn equipment to motorized equipment. The members mounted the soda acid tank along with other firefighting equipment on top of a passenger car chassis. However, its power was grossly inadequate and the firefighters ended up having to tow this piece of equipment to the fires. The Fire Company’s 50th Anniversary Celebration booklet reminisced: Its performance was like that of the steamboat Mark Twain described as so under powered that when the pilot needed to blow the whistle he had to stop the boat. Its life as a firefighting vehicle ended in 1922 when the firefighters had to tow it to a fire at the Beechdale Duck Farm. Two-wheeled Handcart with Soda and Acid Type Tank (1910-1916) – Hand-in-Hand Fire Company’s first piece of firefighting equipment on wheels was purchased soon after the company was chartered in 1910. 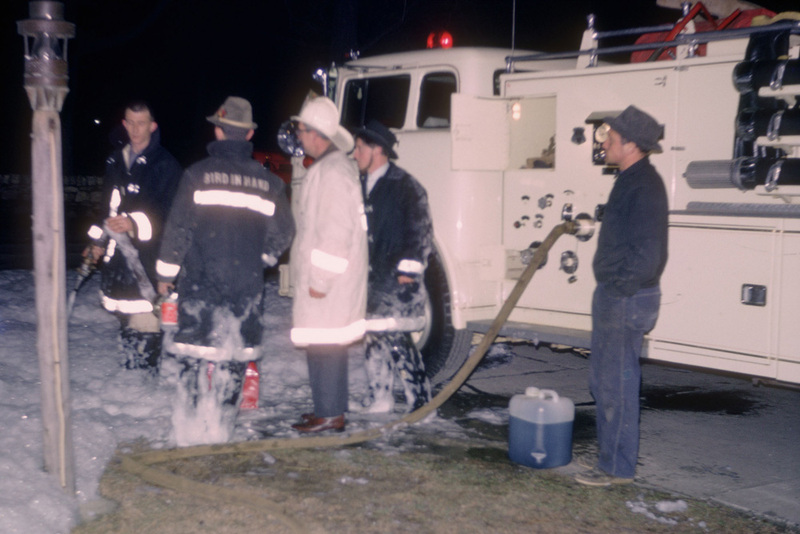 Led by President Frank Shirk, the group of volunteer firefighters decided on the soda and acid type equipment. It included a sixty-gallon tank mounted horizontally on a two-wheeled cart, two rubber buckets, one hundred feet of ¾ inch hose, two lanterns, and an axe. Because it was a cart designed for pulling manually by the firefighters, it had 50 feet of rope wound on a reel that was attached to the front of the cart. Later the rope and wheel were discarded and replaced with a hitch. Horses were then used to pull the cart. From 1910-1916 the Fire Company owned three such wagons. The original handcart without the tank was sold to Christ B. Miller in December 1921 for $5.60. 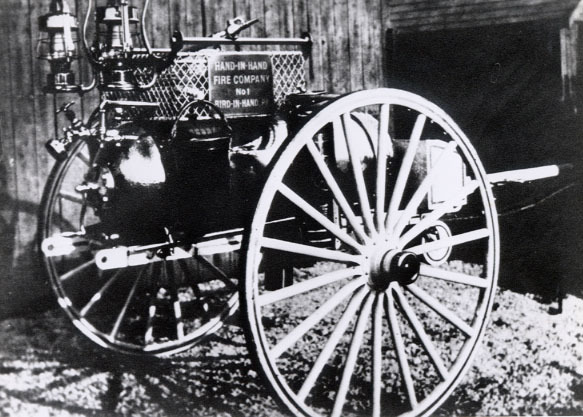 One of the early horse-drawn wagons has survived and had been on display in the lobby of the fire hall before the 2008 addition was built.